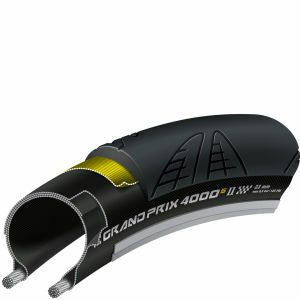 The Continental Grand Prix Clincher Road Tyre is a part of cycling history. In the late eighties it signalled the start of the modern racing bike clincher and is known for its outstanding quality and performance. This latest version includes a densely woven PolyX breaker layer in the casing for anti-puncture protection and the Black Chili compound for improved grip. It also features a modern profile design and TWI (wear indicator). - A.D.
My first foray into the world of 25 mm tires (always have rode Continental 23's in the past) and, after my first ride today I must say I'm impressed. Noticeably more comfortable going over bumps and rolling speed seems to be the same on a 60km route I know well. I had to tweak the tire clearance adjusting screws slightly on the rear tire axle inserts located on the frame to provide sufficient clearance for the larger tire radius. I expect good things from these tires in the future. 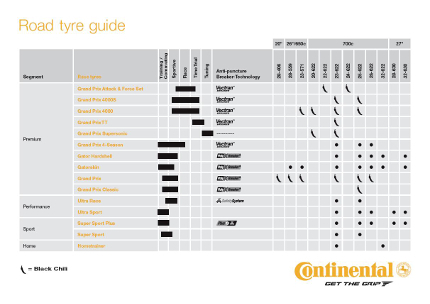 The Grand Prix tire family offers really great quality at an affordable price. I've been using these tires for the last year or two and I am really happy with them. They seem to hold up well over the miles and are rated well for rolling resistance. There's a reason these rubbers have such a good rep. Fast, grippy and durable. A great option for any level of recreational rider or keen racer. 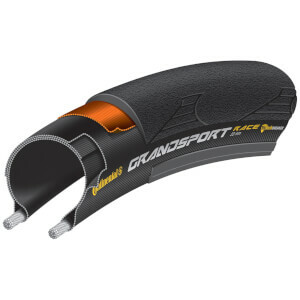 The 25mm increase comfort with no decline in speed or aerodynamic loss on carbon rims. Pro Bike Kit hasn't responded to my email and that's very bad business. I ordered two of these and I think they they are old. There are cracks and the sidewalls are coming apart. This is extremely dangerous I'm getting a refund. Continental Grand Prix are the best! These tires have the best combination of rolling resistance and durability. I love these tires. Needed a fast tyre (don't we all?) I haven't race for years, so I don't have a fully spec'd race bike with speedy tyres for the weekend anymore, but life is too short to ride round on tyres that feel like a piece of garden hose on the rim compared to silk tubs. I used some Pro 3 Race for 1500 miles - no probs. They get a bad rap for being fragile, and while they are pretty flimsy I had no troubles. Yet the doubt is always there that you are vulnerable to the odd sharp thing on the ground, so I tried various options, and found that the Conti Grand Prix is a great balance of 'race-able' and durable (the Rapha Condor JLT team race them in 25mm). I have switched to 25mm, and the benefits are tremendous. Try it, you'll be amazed. There are some very mixed reviews about tyres, but honestly, I am no noob that is giving subject opinions here - I've been a cyclist for 32 years, raced since I was 14, had LOOK pedals in 1986!! (everyone said they'll never catch on.....), won road races, and rode the junior nation road champs (with Chris Boardman among others), so I'm not without a decent frame of reference lol. And I'm VERY fussy about my kit too :-) Good tyres for crits and rough roads particularly, but they belt along on the smooth stuff too. I can't recommend them highly enough. These are good honest all rounders for training and I am hoping that they will give me good service over winter. the higher profile than the tyres that I usually ride is proving comfortable and smooth and they handle like a racing tyre. The rim fit is easy and they grip very well. 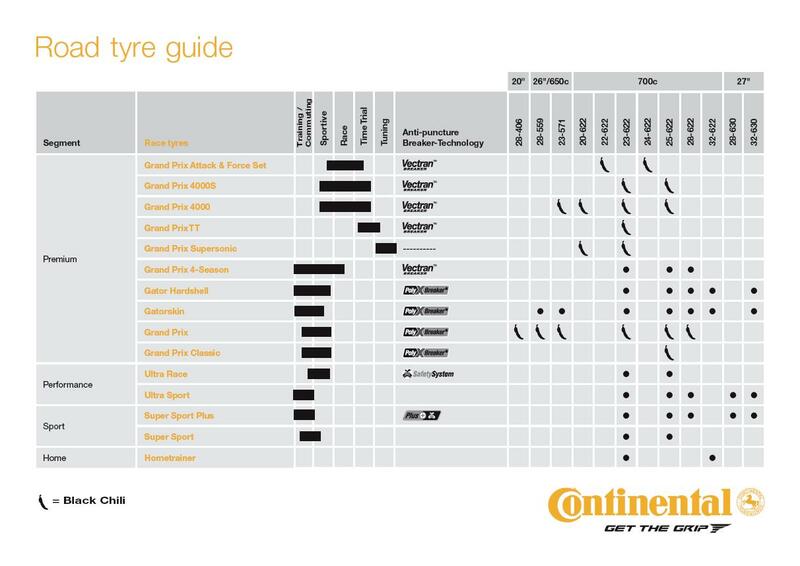 Needed to replace last years training tyre which was great not one puncture and did 10,000km. Decide to give Conti another try, had a bad run on GP4000's, so brought these. So far 1000km done and they are awesome. Roll great, handle well in dry and wet and so far no punctures.